Italy kept pace with Spain in European World Cup qualifying as goalkeeper Gianluigi Buffon played his 1,000th professional match in a 2-0 victory over Albania on Friday. A first-half Daniele De Rossi penalty and late second from Ciro Immobile was enough to earn the Azzurri three points but they remain behind Spain on goal difference at the top of Group G after La Rioja downed Israel 4-1. Manchester City forward David Silva and Chelsea’s Diego Costa were on the scoresheet alongside Vitolo and Isco, while Lior Refaelov netted Israel’s consolation. 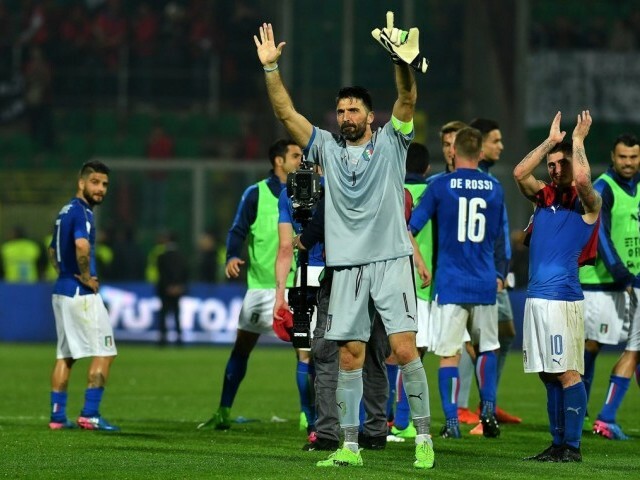 In Palermo it was a day for Buffon to savour as he won a European record 168th cap and helped Italy extend their unbeaten run in qualifiers to 55 matches (41 wins, 14 draws). De Rossi converted the spot-kick on 12 minutes after Migjen Basha, one of six Albanians plying his club trade in Italy, brought down Andrea Belotti. Albanian fans threw flares onto the pitch in disgust and when they did so again just before the hour mark, the game was suspended for five minutes. Immobile made the game safe 10 minutes from time by heading home a Davide Zappacosta cross. Spain had their game wrapped up by half-time in Gijon as Silva drove home a pass from Jordi Alba before Vitolo’s shot in first half injury time squirmed under Israel goalkeeper Ofir Marciano. Diego Costa headed home a Thiago Alcantara corner on 51 minutes. Refaelov gave the visitors something to cheer with a left-foot effort on 76 minutes, just moments after Rami Gershon had struck the post with a header. But Iago Aspas teed up Isco to put the gloss on a comfortable win two minutes from time. Defeat saw Israel slip four points behind the two Group G heavyweights with five games left to play and only the pool winners guaranteed a place at Russia 2018. Republic of Ireland captain Seamus Coleman suffered a broken leg in his side’s 0-0 World Cup qualifying draw with Wales on Friday, manager Martin O’Neill confirmed. Everton right-back Coleman, 28, was given oxygen and stretchered off after his right leg was left horribly bent by a foul from Neil Taylor, who was sent off, in the 69th minute. Clint Dempsey made a fairytale return to international duty with a hat-trick as the United States reignited their 2018 World Cup qualifying campaign with a 6-0 thrashing of Honduras on Friday.